Catherine Jaroszewski ’22 grew up in the small town of Frazze, Minn., just outside of Detroit Lakes, where her future was planned at a very early age. Catherine began playing piano at the age of six, and by fourth grade she had won her first state piano competition. This experience solidified her love for music, and by fifth grade she was already looking at colleges when she discovered the University of Minnesota Duluth’s piano program. By her junior year in high school, Catherine had been heavily recruited by a UMD Professor and was offered a full ride scholarship for her musical talent in both piano and saxophone. Fast forward to June 2018. Catherine was preparing for the European tour of the Minnesota Ambassadors of Music, when the entire trajectory of her young adult life changed course. Three days after performing her senior high school recital, Catherine received a phone call from UMD’s music department letting her know that the UMD professor — her mentor and advisor — had left the university. For the first time, Catherine questioned if UMD was still the school for her. Catherine’s mom called Catherine’s longtime piano teacher, who they knew and trusted like family. As it turns out Marcia Knuttila is a class of ’72 Saint Ben’s alumna and a personal friend of Dr. Ed Turley. Knuttila offered to contact Dr. Turley about Catherine. Hesitantly, Catherine agreed to tour Saint Ben’s. She still felt torn about UMD as that was the only school she had ever dreamt of attending. By the time she arrived on campus, the admission staff was there to greet her. Meetings were also set up with Dr. Turley and Deirdra Harkins from the music department. 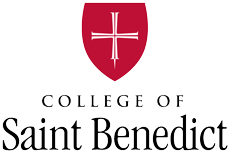 Later that evening, Catherine began to make a list of the pros and cons for both Saint Ben’s and UMD. As she was making the list, she remembered a recurring dream she had been having. In this dream, Catherine would find herself in a religious community surrounded by Sisters. This dream was so concerning to her that she had discussed it with her mother. You see, Catherine was raised in a faith-filled home, which is an integral part of her life. As she reflected, she questioned if she was meant to be a nun. Her mother told her it could simply mean she should consider being near a monastic community. By listening with the ear of her heart the next morning, Catherine woke up early and immediately knew Saint Ben’s was the school she should attend. Before anyone else in the family awoke, Catherine had already submitted her application. On July 5, one day before she was to leave for Europe, Catherine received her letter of acceptance, along with a full music scholarship in addition to merit-based aid covering half of her tuition. During the Campus Resource Fair, Catherine met S. Stephanie at the monastery table and they formed an immediate friendship. Since then, she requested S. Stephanie to be her Benedictine friend, and the two women have met several times. Catherine is active in the music department, is a pianist in the Women’s Choir and plans to obtain a Ph.D. in music.